Ever missed a deal on Woot? Well, if you did, it might end up here if the items are still in stock. As Woot puts it: "where we sweep out the very last bits of inventory for items that have already had their day in the Woot sun. It's also the place for deals which we might not have in large enough quantities to feature on Woot". In other words, this is the place to get deals that are too good to pass up! Sellout.woot.com currently ranks #12 amongst sites offering online deals -- DX Offers ranks #11. In the General Merchandise category, Sellout.Woot ranks at #9 -- Deals.dx.com again ranks slightly higher at #8. 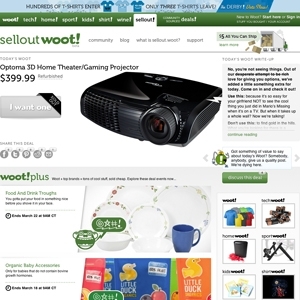 Sellout.Woot is considered the most popular deal a day site, ranking in at #1. As for the 2nd most popular site, it's Giveaway of the Day.